Ten Days on the Island is an engaging and entertaining aesthetic experience that brings together hundreds of local artists and reflects on the lives of many more Tasmanians. Dream Masons, the magical spectacle that took over the Salamanca Arts Centre revealed the possibilities of large scale performance with committed volunteers working with professional artists. 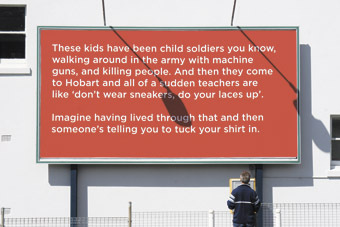 The write/here project with its 27 billboard works across Hobart gave voice to some of the city’s inhabitants. The Port Arthur Project saw 25 visual artists respond to a morally and aesthetically complex historical site. Homage was paid to lives in remoter parts of Tasmania in Big hArt’s Drive-in Holiday, Silkwood’s Maria Island of Dreams and is theatre’s Queen of the Snakepit (about Flinders Island). An Other Place in the Long Gallery revealingly juxtaposed works by Tasmanian and Irish artists. And the Tasmanian Art Gallery & Museum celebrated the work of one local artist Leigh Hobba—a rewarding show that demands to be seen elsewhere in Australia. As in all festivals, some works fared better than others, but few appeared short of audiences. Some, like Tasdance’s Mercy seemed oddly conceived but proved curiously memorable. An eccentric new work like Queen of the Snakepit has plenty of room to develop while Robert Jarman’s Spectre of the Rose could have been all the more powerful had the performer-audience relationship been more precisely addressed. Once Dream Masons got past its long, sluggish scene setting, it accelerated into the work we were hoping for, where its virtuosities were not lingered over and the pace matched its cartoonish conception. Hopefully it will prove a model for ambition in Hobart’s performing arts scene. It’s easy to think of Ten Days as a string of one-person or small cast shows in theatres and intimate gallery showings and the Spiegeltent-style Crystal Palace cabaret events, but artistic director Elizabeth Walsh has cleverly contrived to bring many into the festival’s fold with the large scale works mentioned here and seen in streets, in galleries and across the island. The RealTime team enjoyed contributing to Ten Days with our admirable team of five emerging reviewers who worked day and night to produce reviews indicative of the range and quality of an idiosyncratic festival. Eds. RealTime issue #78 April-May 2007 pg.